I’ve been saying this for years, but do people listen? No they don’t. Let me be clear, by all means share your content for free on any of the gazillion social media platforms available. And if you can get paid appropriately for creating content for others, good for you. Otherwise, make sure that your content remains under your control. Geocities was once the third most visited site on the internet. 38 million user-built pages! Nothing but a distant memory now, unless you live in Japan. Remember when your friends saw everything you posted on Facebook? Not any more, unless you pay up. Ah, those glorious days when you posted something in a LinkedIn group and a significant number of people would read it! Long gone. 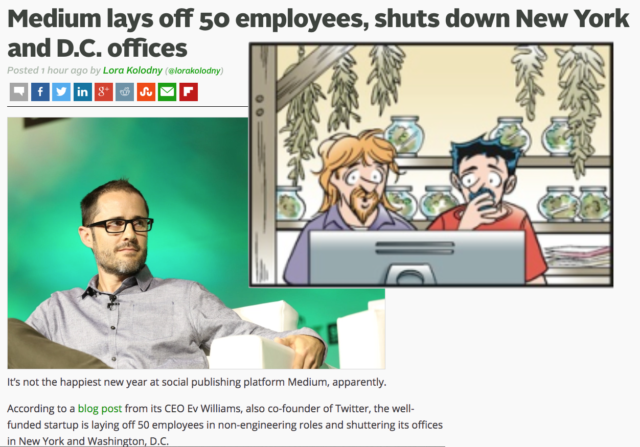 Now the blog host site Medium announces a layoff of a third of its staff. There are millions of posts on the site. Will Evan Williams pull the plug some day? Will social journalism survive? Who knows? Get the picture? Posting your original content exclusively on someone else’s platform puts you at their mercy. Don’t do it! There are plenty of great platforms available, and lots of fine web hosting services to run them on. For example, this site uses WordPress on a Dreamhost VPS (Virtual Private Server). Control your own content. You can add, edit, delete, and control comments on it at any time. Determine how your content is presented. Want to insert an offer for your services or products in the middle of a blog post? No problem. Build your own brand, authority, and SEO, not that of a third-party site. Maintain access to your content. If your web hosting service goes bankrupt or is unsatisfactory, you can transfer your content to a new host. As long as the internet is up and you pay your hosting service, your content will be available. Seven years ago I started the website you’re reading. As expected, hardly anyone visited initially. As I steadily added content (at least once per week) viewership grew. According to my weblogs, this site is now one of the most popular websites on meeting design and related issues, with 31 million page views to date, 25 million of which were made in the last three years. As a result, this website is now the largest source of client inquiries for my consulting and facilitating services — something I would never have predicted when it went live in 2009. And the ever-growing body of articles on this blog and the inbound links to them continue to build my brand, authority, and SEO. This has been a PSA from Adrian Segar. This entry was posted on Monday, January 9th, 2017 at 6:23 am	and is filed under Social media. You can follow any responses to this entry through the RSS 2.0 feed.You can leave a response, or trackback from your own site.